I guess it wasn’t very nice to post the Perfect Pizza Crust with the picture of a mouth-watering pizza, and no recipe to go with those toppings. At least I didn’t tell you, until now, that what you saw had bacon on it. Yes, bacon! As all carnivore’s know: Everything tastes better with bacon! You will notice that there’s a baking temperature range, the reason: My oven can go as much as 25 degrees above what I set it too. So I have baked many pizzas as low as 425° as high as 450° and often times somewhere in between. They always turn out well, but leave a little guess-work (and oven-sitting) for me each time. Find a good time/temperature ratio for your pizza and stick to it. Pizza crust recipe here, or your favorite crust will work fine. 2-3 Cups Fresh Spinach you can place this on before the cheese too, either way it works great. You can see in photos, one has it placed on before the cheese and one after. Bake in an oven that’s been pre-heated to 425°-450° for at least a half hour. 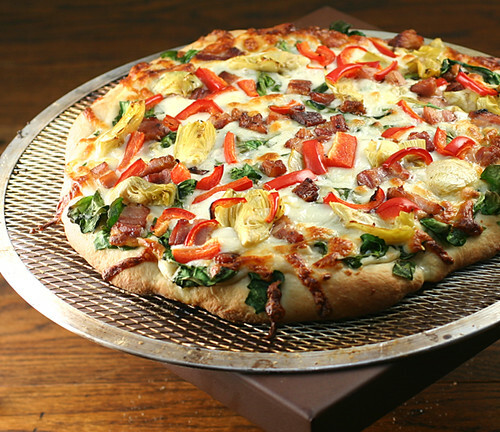 Use a Pizza Stone that’s also been in that hot oven for the same half hour. Everything does taste better with bacon. 😉 Beautiful pizza. My husband hates breakfast for dinner and he’s not eating tonight, so my daughter and I are making breakfast pizzas – problem is Hannah doesn’t like red sauce (I know, where did I go wrong in her upbringing??!) I was wondering what sauce to use and wouldn’t you know you have the perfect one! I’ll take two slices to go please! That is right after I replace the monitor I just sliced into… Fabulous photo!!! I miss you! hope you’re well. That article was posted on the Huffington Post website, then they DELETED it! So glad you found it for me. That’s my kind of pizza!! It looks so satisfying. I definitely agree, bacon makes everything taste better! 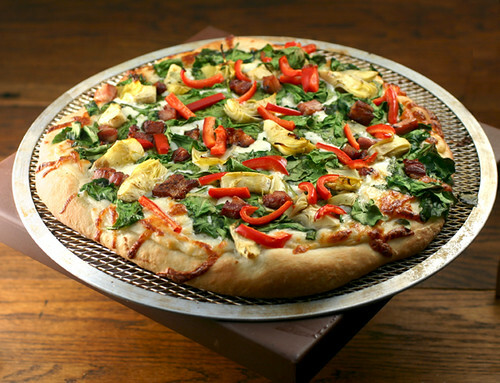 This pizza looks downright gorgeous! Gorgeous! The toppings on this pizza is like a who’s who of my favorite foods! This is a pizza that I would totally order! Great job! What a great pizza! NomNoms! I must try!